It’s no surprise that the composing team behind this visceral score work – Marco Beltrami (Knowing, Live Free or Die Hard, Terminator 3) and Buck Sanders (Descent, Mindgame) – have teamed up before (on the comic-book actioner Max Payne). In fact, Buck Sanders has been working with Beltrami since 1997.Â As for this particular piece of work, Beltrami explains the eerie final product in the soundtrack’s liner notes: “Thematically we decided it should conjure up images of a western since the main character’s attitude is that of an independent cowboy. Then we used various performance techniques to achieve the atmosphere of an unpredictable, alien landscape.” This western motif is especially present in the carefully-toned notes of “The Way I Am,” the final track on the 31-minute album, a track that not only captures the emotional depth of the film’s main character, but also nicely sums up the entire album – playing as background music to the final scene of the film it works even better. What’s pleasantly surprising about The Hurt Locker as a soundtrack album is that it does work so well on its own. Buck Sanders describes Kathryn Bigelow’s desire to “blur the line between sound effects and score” saying that they “decided to use a small ensemble and some of the film’s production sounds and then fused them together.” With that in mind, it would be easy enough for the music, so closely tied to the action on the screen, to could come off detached and even repetitive without the haunting images that it supports. On the contrary, the sounds Beltrami and Sanders created for the film successfully instill the listener with a sense of urgency and emotional intensity difficult to recreate with sounds alone -listen to the rising and falling action in the nerve-wracking track “The Long Walk” for proof of this. “It was evident from the moment I met Marco Beltrami and Buck Sanders that they would provide the perfect sonic tapestry to animate these existential themes of man and death,” says directorÂ Kathryn Bigelow. Though Beltrami and Sanders were left off the Original Score nomination list for the Golden Globes (as a side note composer Abel Korzeniowski earned a nod for his similarly subtle score work on A Single Man) this is one of the best soundtracks of 2009. Expressing painful emotional intensity (“Body Bomb”) as well as more fast-paced action (“The Hurt Locker”), the 12 tracks on this album are impressive and memorable. 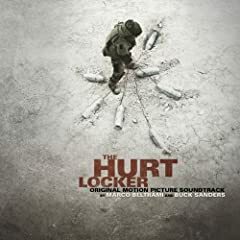 No user commented in " Music Review: The Hurt Locker Original Motion Picture Soundtrack, by Marco Beltrami and Buck Sanders "